When making a copy of simulation, using the same geometry, meshing will ignore MRF rotation zone definition. Result: if you Generate new mesh with identical setting (to MeshForTriBladeSep), MRF zone definition will be ignored. I tried it twice and last result is in simulation ‘TriBladeSepInf2’. I stumbled upon it when trying to add Inflation zone to well defined mesh. I look now for explanation and help from support. Thanks a ton Andrzej for this detailed description! Will investigate this case more closely in the evening and get back to you as soon as I know more. Recreating the mesh without using copy does not create mesh for MRF rotating zone. Example is ‘TriBladeSepFresh’ simulation, where I did copy the simulation and started new mesh (Mesh 28) filling all parameters by hand. Possible conclusion: meshing process itself was updated in mean time (last few days) and has different priorities. Is there a step-by-step instruction that you can provide us with on how to reproduce this or is it just “copy & mesh” to get this kind of behavior? Curious about that. If it is reproducible I will report it. Step by step guide is in my first post here, on the top of the thread. By the way: can we have a list of implemented fixes (what, why, when), up to date, please? This would help us to hint about possible culprit of SimScale misbehaviour. Currently it is 100% opaque, I can only muse that fix came from OpenFOAM. Or not, if you did branch sources and develop on your own. Okay I see - so nothing has changed in the process of reproducing it so far. I will also ask our developers about the bug log. Just to add to this, I am also having the same problem with duplicated meshes not producing the MRF zones. I agree with @Retsam , that it would be extremely helpful, to provide some kind of message when new updates are made, or problems such as this are found, so that users can know if meshes or simulations will not run properly. This would cut down on frustration, and wasted core hours. Thanks a lot Dan for confirming this issue! Sorry the lost productivity so far - the engineers will have a look into this! We will keep you informed about the progress! Update: The fix has been released! Please check if everything now works properly for your cases. I confirm @jousefm, that fix works for me. Thank you! What is short story about that glitch, please? I also ran a new - copied mesh simulation and everything worked great. Thanks @jousefm! First of all - I’m very sorry for all the problems you had. Thanks for reporting it so quickly! I wanted to chime in and give an answer to @Retsam’s question how the bug came about in the first place. 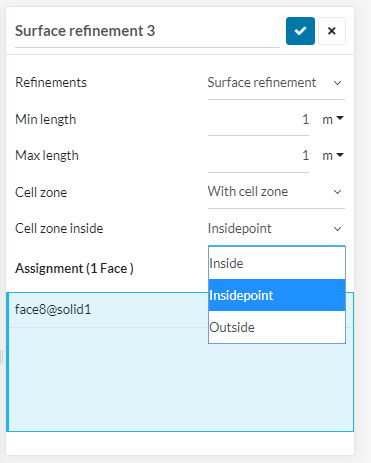 We decided to remove the options “insidepoint” and “outside” because they didn’t provide any value but rather added confusion and caused errors sometimes. The corresponding changes had to be done in 2 different services and one of them wasn’t updated accordingly. The result was that the “new style” cell zones weren’t recognized properly anymore and so they wouldn’t appear for you guys anymore. This problem shouldn’t have occurred in the first place. Unfortunately our automated tests didn’t catch this. Moving forward we’re going look for a way to test this particular type of bug and add more automated tests around cell zones to make sure they don’t break in this particular way anymore.